23 May the God of peace himself sanctify you completely. 24 He who calls you is faithful, who will also do it. In today's promise, we read that it is God Himself who has sanctified us through the free gift of His Son, Jesus Christ. 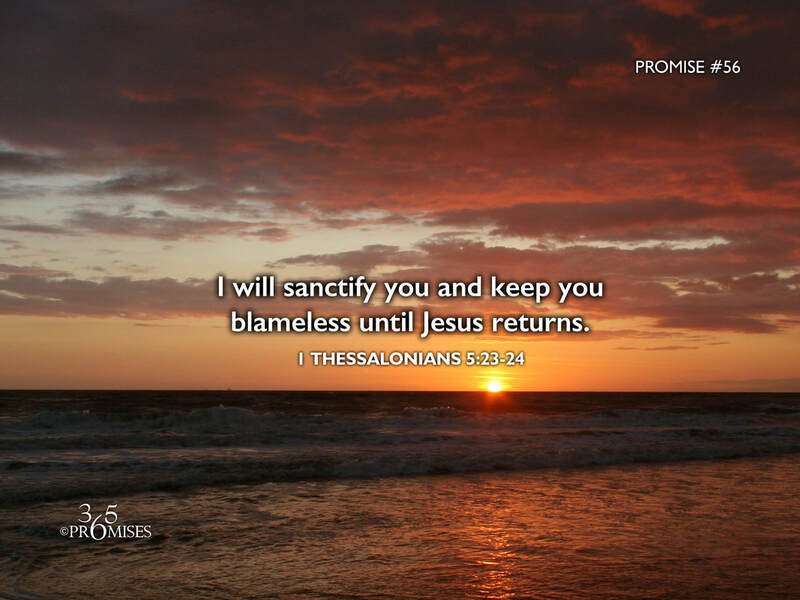 He initiated the beginning of our life in Christ and He will keep us blameless until the day that Jesus returns. I believe it is important for us to understand that it is God's faithfulness that will bring the fulfillment of this promise, not our own self-effort. It is His faithfulness that we can rely on because of His goodness towards us. He is the One who has called us to be in His Son. In Ephesians 1:3-6 we read of our Father's eternal plan where He chose us to be in Christ before the foundation of the world to be holy and blameless in His sight. He chose us and by His grace and mercy, He will keep us. We can rest in His goodness to sanctify us and keep us blameless until Jesus returns because He is a good Father who has our best interest at the very core of His heart. My prayer today is that each and every one of us would be comforted with this truth and live a life with the assurance that He will keep us blameless until the day when we see Jesus face to face.